A pre-Christmas legal bombshell entered the fray with word another possible legal tendering centered on the Hatch Act and the arrival of Carmelo Garcia replacing his friend Ruben Ramos who is departing the Assembly seat. Word of a possible second legal challenge when Garcia actually holds the office of Assemblyman has been broached over months but it was thought among many in legal circles to be an effort not worth filing. 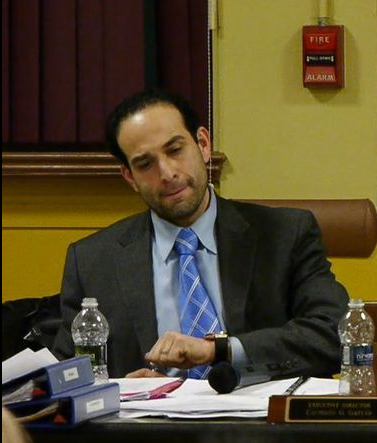 The news if true can't be sweet for State Senator Brian Stack who picked Garcia on his machine slate for the position last spring and has reportedly called the selection "a mistake" to vocal Hobokenites who phoned him with their misgivings. of Hudson County Superior Court may see another legal challenge to his Assembly-elect seat. The rumored legal challenge comes outside Hoboken based media on the new Hudson County political website - Hangin' on the Vine. The report says once again the Hatch Act will be the impetus for the lawsuit against Garcia once he officially takes the office of Assemblyman and the federal regulation becomes valid. An earlier suit on the question had been decided lass spring in Hudson County Superior Court saying Garcia's earnings of 165,000 are paid with federal monies making him ineligible to run for partisan elected office before being overturned in the NJ Appellate Court. A new legal challenge would claim Garcia is ineligible upon taking office. A person who serves in a similar capacity with a housing authority told Hangin on the Vine that it is doubtful that Garcia can survive a challenge. Their opinion was based on their knowledge of federal and HUD laws governing such situations. The news hits just before the Christmas holiday when typically the news cycle slows to a crawl into the New Year and comes on the back of MSV's exclusive Friday report Carmelo Garcia's "ethnic cleansing" lawsuit looks likely to be thrown out of court. Talking Ed Note: Is karma unifying with Christmas this year? If true, congratulations to the Vine website on its exclusive. It's the Vine's biggest "get" to its start.